Born in Toronto’s Parkdale, Stuart moved to Cabbagetown neighbourhood in 1980. He studied illustration al George Brown College, and Ontario College of Art, and figure realism at Angel Academy of Art also workshops with influential artists. He worked as Graphic Illustrator with The Canadian Armed Forces before travelling through out Europe. He worked in the advertising field as illustrator for TDF Artists and other studios and then, and still does, free-lance illustration. 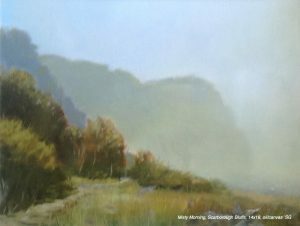 He pursued work in plein-air painting since 2000 and has been showing since 1995 with work in private collections through out Canada, USA and Britain.